We are officially one month away from the first day of Fall! Fall is my most favorite season of the year, and each year I celebrate it by making a big pot of chicken soup. And not just any chicken soup….Cream Of Chicken And Wild Rice Soup. Yes, every letter deserves to be capitalized. I’ve been making this soup for approximately 16 years now. When I was in college I worked in Pepper Place in downtown Birmingham, where Crepe Myrtle’s Cafe (now in the Little Professor in Homewood) had a tiny soup and sandwich shop inside one of the antique stores. Somehow my boss’s wife was able to sweet talk the girl behind the counter into giving her the recipe for their Cream of Chicken and Wild Rice soup, which she wrote down on a sheet of paper and photocopied for me. I still have that recipe somewhere with my lipstick print blotted onto it because I carried it around in my purse for a while before I filed it away and used it as a lipstick blotter once (It was the 90’s… don’t ask). Sixteen year old lip prints and a faded recipe is worth a picture on this here blog, but unfortunately it’s packed away with the rest of my recipes somewhere in the pit of my basement. It’s a good thing I committed this recipe to memory years ago, huh? When the weather turns cool, this is what I crave. It makes a most excellent gift if you put it in big Mason jar and tie a ribbon around it. Bring water to a boil in a large stockpot. Add your chicken and let it cook until it’s no longer pink in the middle. Don’t overcook it though or it will be chewy and gross. While the chicken is boiling, melt the butter in a pan and saute the chopped onion and garlic. You could also add some carrots and celery at this point if you like. After the chicken is cooked, remove it from the boiling water and set it aside. 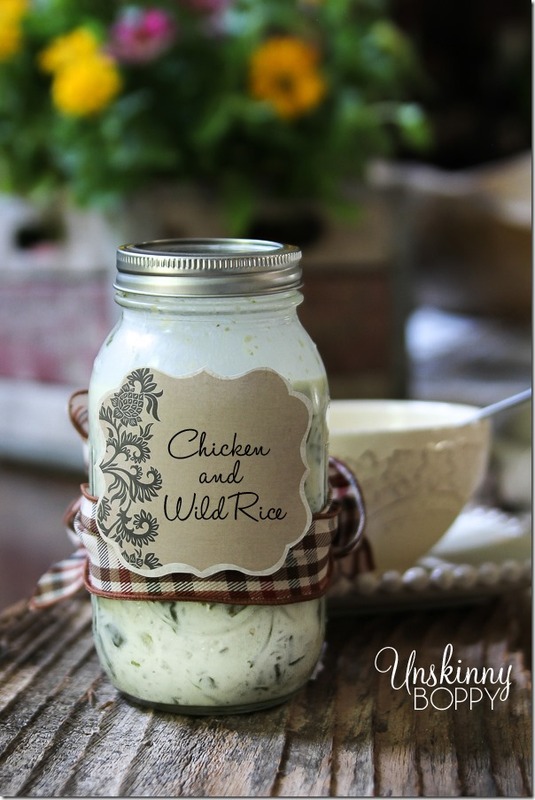 Add the rice, wine and spinach to the same pot with your chicken stock. Boil those three ingredients for 20 minutes. Remove from heat and add back the chicken, along with cream, half and half and salt and pepper to taste. I cannot even begin to tell you how good this soup is. If you need a step-by-step directions on how to make it, I am republishing this blog post from an old one I wrote in 2009! The pics are terrible, but it gives you a step by step of how it should look if you’re a visual person. 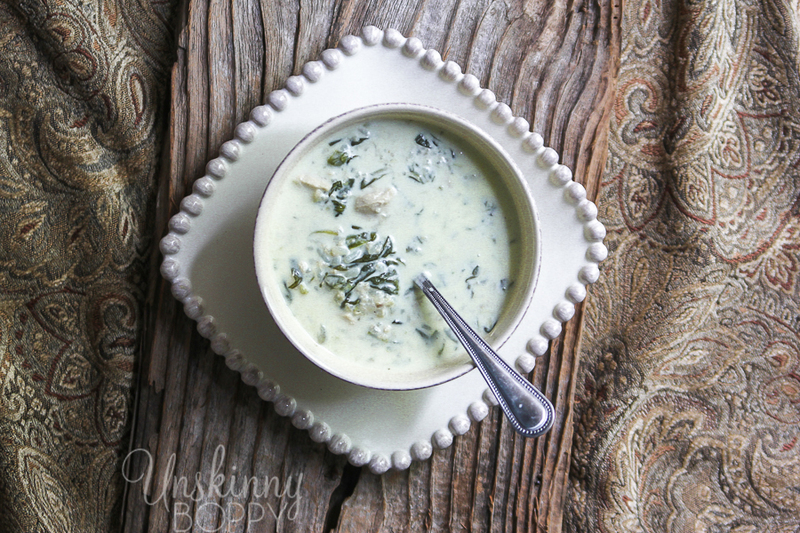 I’ve shortened up some of the steps in the last five years so it’s even easier now, but you can click here for the old Chicken and Wild Rice Soup Recipe. How much water would you guess. Don’t want to make the soup too watery! Probably about 5 cups of water?? I never measure, just eyeball it usually, but that seems about right. Enough to cover 4-5 chicken breast in a big pot! 🙂 I’ll edit my post to give folks an estimate. Thanks for asking! Sounds delicious. I can’t wait for cool weather to make a big pot. Is it just me or are there letters and numbers missing in this post? Makes for a crazy read!! Yum! This will be the first thing I make there gets to be a nip in the air. This looks like the perfect Fall soup. Thank you so much for sharing it with us. 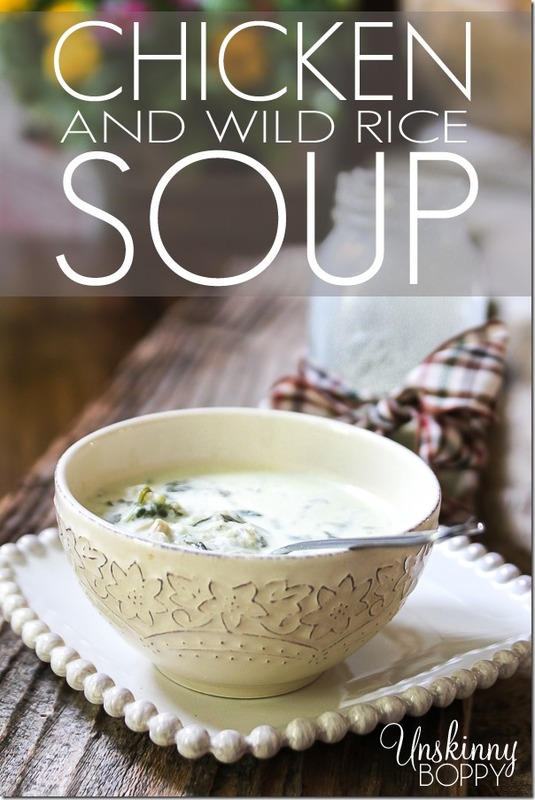 I’m swooning over the thought that Soup Season is right around the corner. 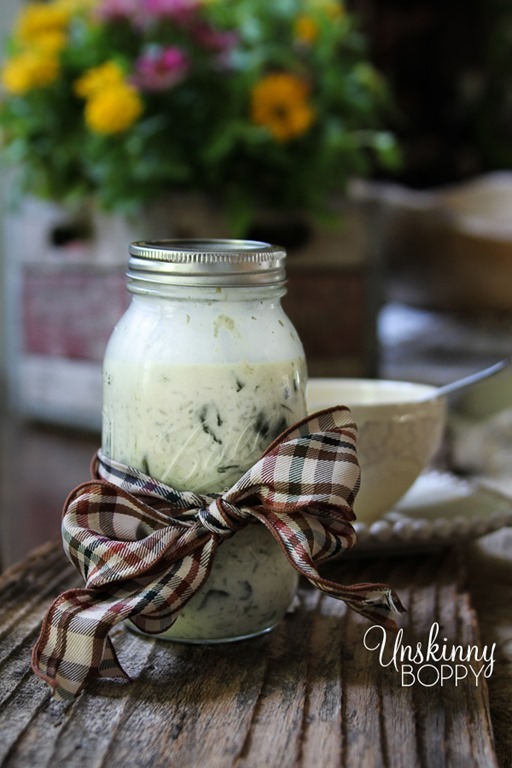 We just found out that Sophie has a severe dairy allergy so I’m going to tinker around with this recipe and see if I can come up with a dairy free version. It looks way too yummy to miss out. Hi!! I was just over at Thistlewood Farms and KariAnne had your soup picture there and I had to come over and tell you that it looks and sounds fantastic. I am pinning it and I will be certain to make it — Fall is upon us brrrrrr!! Good morning! Thanks so much! 🙂 Hope you have a great fall day! 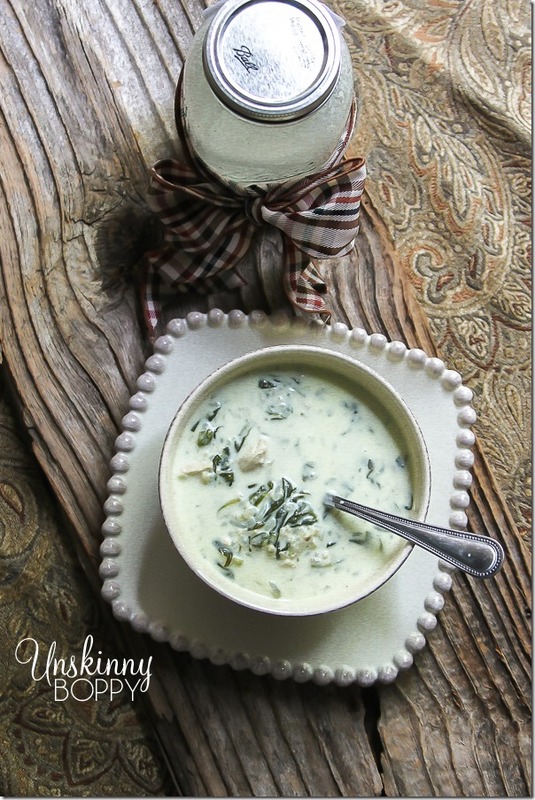 Has anyone tried making this yummy soup with whole milk instead of the cream and half/half? Hey Deb, I’ve never tried this, but I don’t see why it wouldn’t work. Try it out and let us know how it goes! I have been meaning to thank you for posting this recipe! I used to go to Crepe Myrtle’s just to get this soup and I am not a “soup” person! I cannot wait to make it! Thank you so, so much!!! Oh yay!! Mine is not as thick as theirs– you’ll need to let it sit and simmer all day long to get it rich and creamy like theirs, but the taste is very much the same!! do I add the flavor packet included in the Uncle Bens Long Grain and Wild Rice box? Yes! I’ve frozen it with success a few times. Had pinned this in August and finally made it this evening. Absolutely delicious! Yes, it’s that good! O M G…. My house smells amazing right now! I couldn’t wait for dinner tonight – so yummy! We bought a rotisserie chix from Costco today so I used that and subbed 4 cups of chix broth and 1 cup of water. I also used the carrots and celery for added veggies and fresh spinach! Someone asked about the seasoning pack – I used it! So hard to open a bottle of wine and not drink any right now….. Come on August!